so many stamps! 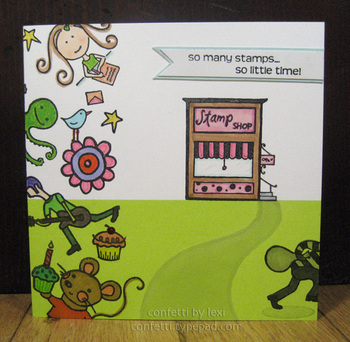 so little time, too--but, i managed to steal a few minutes of it today to play with the stamp shop for the amuseaddicts stamp of the week challenge. i guess it also works for the weekly challenge, too, since it's totally "all about me!" i chose a lot of my current and long time faves from the saltbox studio, a muse and elzybells to feature in my "graffiti" edge and there's that bandit running off with my time!! after i decided where to put the sentiment and added the bandit, i was left with a bit of open green, so i quickly doodled the swervy road to stampin' heaven! i had fun with it, but it's probably a bit much, huh?! as soon as i saw linda's post about making sweet treats with the heart punches for her kids' class valentine treats (she saw it here), i knew that's what we were going to do for ours. 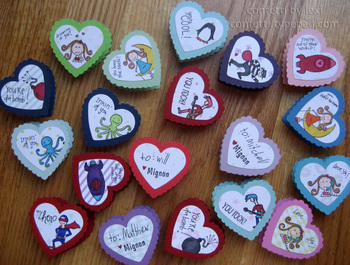 a lot of my saltbox studio, a muse and elzybells stamps are perfect for valentines and very loved by my girls. and i'm glad i was able to get a few of the heart punches before they sold out! 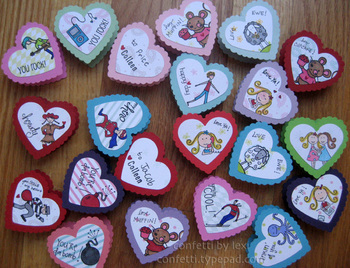 the girls did most of the punching, so i could stamp and not waste the pretty little papers that i'm very low on. but they told me which stamps they wanted, helped with some of the coloring, chose who to give each one to and wrote their names on the back. in order for them to be able to put the to/from on the back heart (i flipped some so you could see), i opted to stamp or write the sentiment on the front. i also stamped some of the larger images off the edge to make them fit better, balancing them with the words as much as i could. copics did a great job covering the patterns of the pretty little papers--even the lighter colors masked them enough to not notice too much. i just love all of the colors and patterns together and the girls were really excited about them! 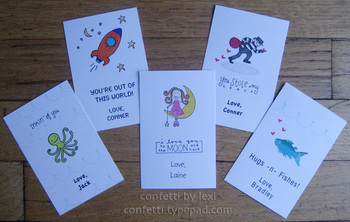 i also created a few personalized valentines this week for a couple friends' kids to give. they are a little bigger than a trading card and combine printing with stamping--for the signature and the sentiment if i didn't have it. 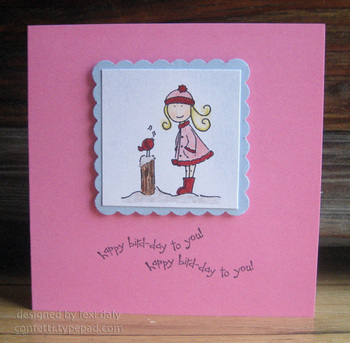 again, i used a muse, elzybells and saltbox studio stamps. i love the size of the the stars & moon, the star and the tiny heart from saltbox--perfect finishing touches! the fish is one that i've had for several years--it's unmounted and unlabeled, but i use it for boys quite a bit here and there--one of the only times i use kaleidacolor pads these days. one more quick thank you for the amuseaddicts challenge! 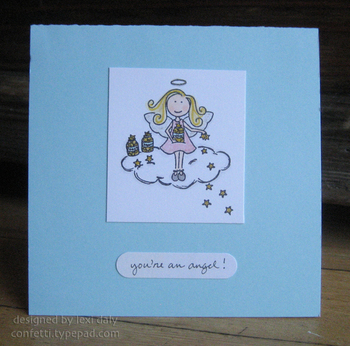 another a muse note card, paired with an elzybells stamp and handwritten sentiment. i kept trying to add ribbon or something to this, but nothing seemed to work as well as leaving it alone. the wings, stars, halo & streaks in the hair are colored with copic spicas--the perfect amount of sparkle. i love those pens! a little note of thanks! i managed to sneak in a little stamping in between designing and printing today--'tis the season to be busy! this is for the amuseaddicts weekly challenge to create christmas or winter themed thank you cards, something we will all need in less than a month. 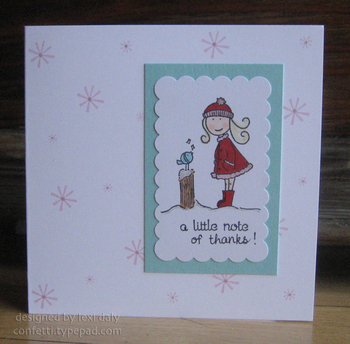 the note card is a muse, the stamps elzybells, with a little added hand lettering by me! today i give you my fourth and final card for the paper crafts wcmd swaps! the theme, all snowed in; the host, pc pro wendy johnson . that brings my grand total to 80 cards made and mailed away. now, i can't wait to see the returns--it's like getting a new magazine, but you can actually touch the cards instead of just look at pictures of them! 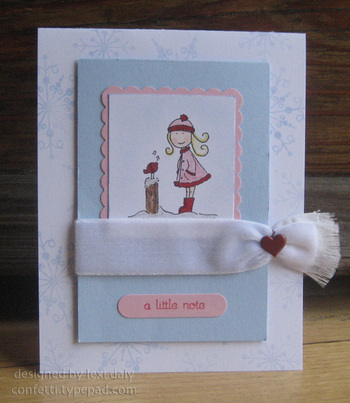 Like all of the others, this card features snowflake serenade by papertrey ink--with a theme like all snowed in, it was a natural fit and the perfect back drop to this winter elzybell stamp. by accident i found out that the martha stewart velvet ribbon looked like a scarf when the edges frayed, which was a perfect look for a cold winter card. the thick ribbon was hard to tie, so when i discovered the heart brad in my stash, it was the perfect solution, and another way to bring in my pop color. i love shopping around my studio and discovering old purchases! a little glitter on elzybell, the bird and the snow is the perfect finishing touch--and while it's hard to see here, there are at least 19 other people who'll definitely get to appreciate it up close and personal!